Two styles are better than one. Can’t mix modern with vintage? Looks pretty darn good to me. Many years ago, one of my favorite projects was with a couple that was having twins, one boy, and one girl. When I met them, they had already found their cribs and their fabrics for each set of crib bedding. For the girl, they chose a pink and white quilt with rose floral. For the boy, they chose a Copenhagen blue, gold and white checkerboard quilt. Fine, except, these two babies were sharing their nursery. My job was to make the walls of this room bring these two completely opposite designs together to for a perfectly cohesive nursery. Oh, and their budget dictated getting this all done with one day of work. Great! Piece of cake! Now this was well over 15 years ago, (I apologize for the grainy pictures.) And the options for crib bedding were just beginning to branch out of the traditional pale pink, green & blues. This room already had a chair rail going around the entire perimeter. So what we decided to do was to paint below the rail with a large blue and yellow diamond pattern. Above the rail we painted a mellow green. 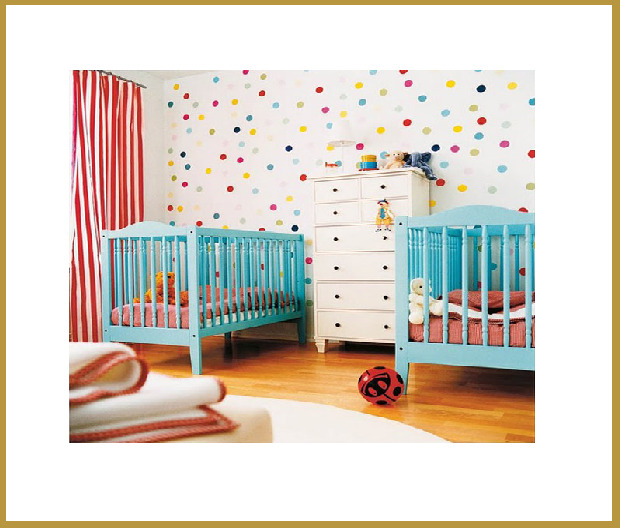 But above each crib, we put an illustration depicting the “What are little boys…little girls made of” lyrics. We painted them in a simple children’s book style. And with each illustration about 3 feet wide and about 4 feet high, it highlighted the colorful cribs and called for very little detail throughout the rest of the room. As I said earlier, today, there are so many options available in the kid’s décor world, the biggest problem most face now is which to choose. Solution…choose a bunch! 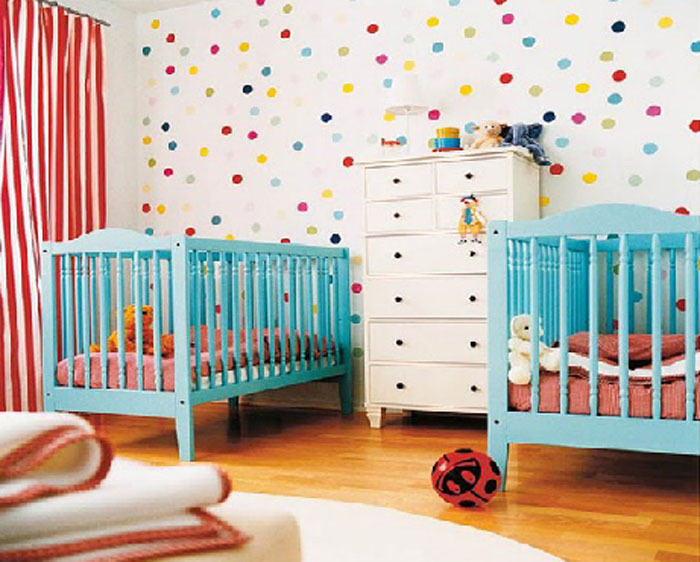 Break the rules and bring in different several colors and patterns on the staple items like the cribs and upholstery. They’re only babies once! Don’t be afraid. Pop Art All the Way. Doubly surreal. Classic Chevron Repeat for the walls is timeless. And mixing the gray, white and yellow raises the bar on the energy in this room. Boys or girls, it’s just…well…happy. Just plain happy. High Design by Lulu deKwiatkoeski in NYC. 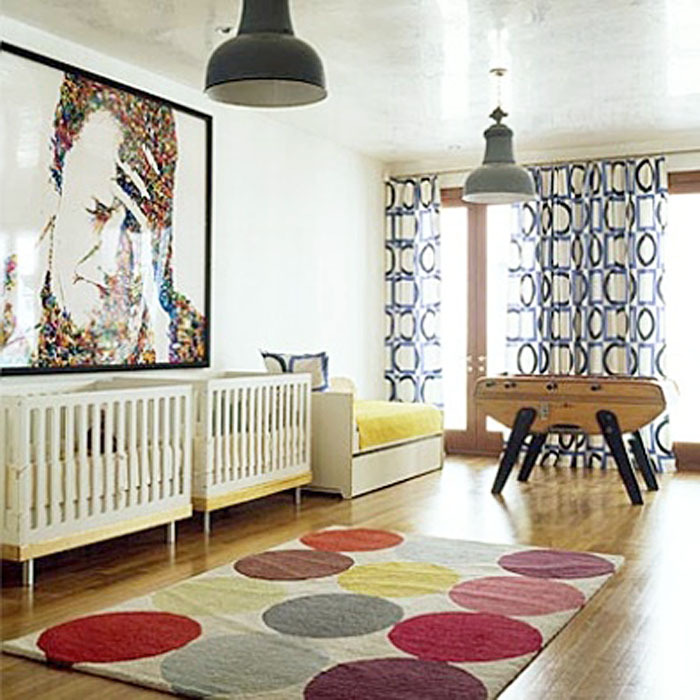 Most don’t think of putting cribs in front of a large piece of art. But this works beautifully. Plus the dark shelving with the white cribs acts as an anchor for the whole space. Smart. Girly to the max. 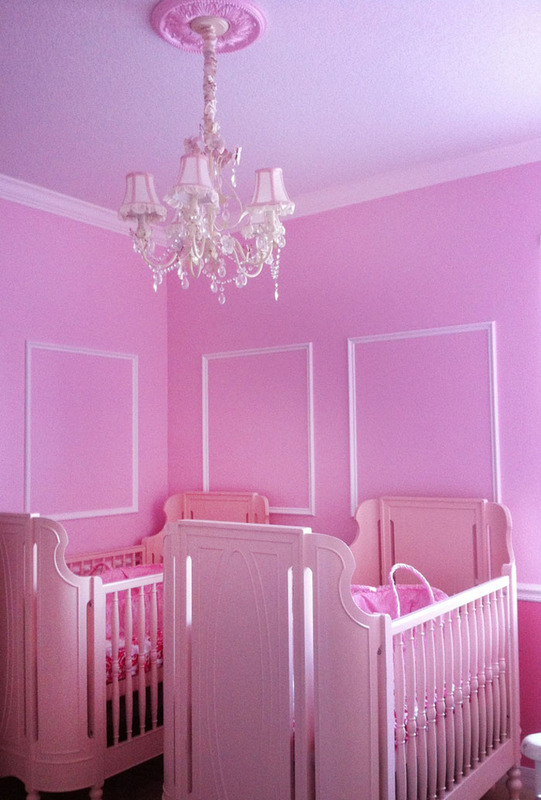 One of these cribs is awesome, but two is unbelievable. And if you like the color, just keep going! Choose just one primary as the accent on a totally white canvas. 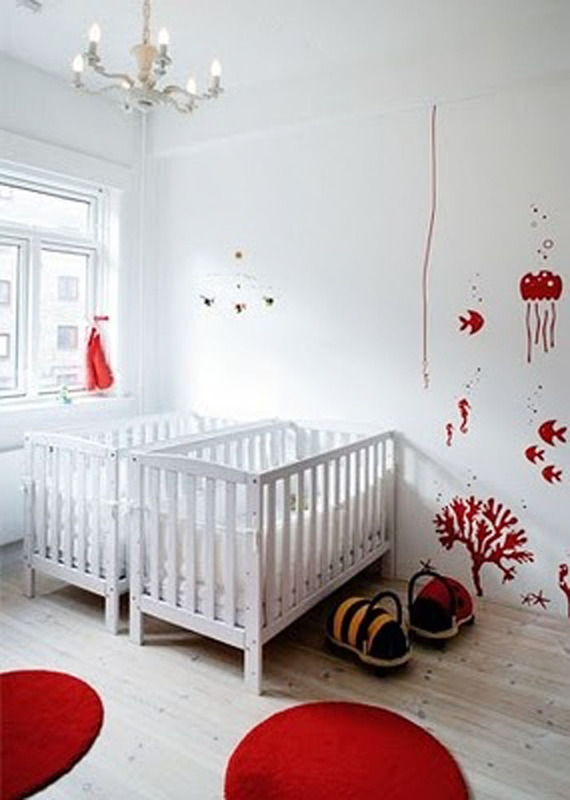 If you really want to be bold, once these kids can jump up and down in those cribs, just give them each a red crayon. Ha. That would be insane! 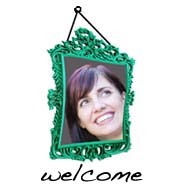 Get inspired by a theme (like a Circus) but leave the theme out! Stick with the patterns and colors. Familiar, but fresh and unpredictable. I think this room needs an enormous elephant that these kids can ride together. Make the whole room the mobile. Twins may put a dent in your budget. But they don’t put a dent in creativity. Let’s end with a little Novogratz. Why? Because if you’re going for the surprise and unexpected skill of throwing curveballs, Novogratz is always a Grand Slam. Do we have any twin Nurseries out there? Please send them our way. How did YOU make it work?